A slow start in the National Lacrosse League can just about spell defeat for any team. That’s been the problem in four of six games for the winless Philadelphia Wings (0-6) so far, but Saturday night at Wells Fargo Center it was actually a slow finish that clipped the Wings as they fell to the Toronto Rock (5-1) 13-12 in front of 11,164 fans. The Wings came out and scored the first four goals of the game before the the four-minute mark of the first quarter. Adam Jones finally put the Rock on the board with a power play goal, but Kiel Matisz responded to give the Wings the 5-1 lead after the first. Kevin Crowley assisted on all five of the Wings’ first quarter goals. Crowley scored his first of the night to start the second quarter as the Wings increased their lead. Toronto responded with a goal from Adam Jones that just squeaked over the line. Johnny Powless and Dan Lintner would add markers before Blaze Riorden would score with under a minute remaining in the half, and the Wings would lead 7-4. Chet Koneczny and Billy Hostrawser dropped the gloves as the fans were entertained to a fight, won by Hostrawser as he connected with a quick left after switching his grip hand from left to right. The Wings outscored Toronto 3-2 in the third with the help of a five-minute power play as Kieran McArdle received a high-sticking major with 19 seconds left in the first half. Philadelphia was only able to score once during the major though they took a 10-6 lead into the final 15 minutes. And did they ever play hard in the fourth. They came out and scored the first five goals of the quarter in 6:22 to suddenly lead 11-10. Tom Schreiber, who had been effectively held in check earlier, scored twice in that run, and after 51:22 of playing time the Rock had the lead on a goal by Rob Hellyer. Crowley tied the game at 11 with his fourth of the night. Adam Jones and Matt Rambo would the swap goals as they tied at 12 with only 6:29 remaining. 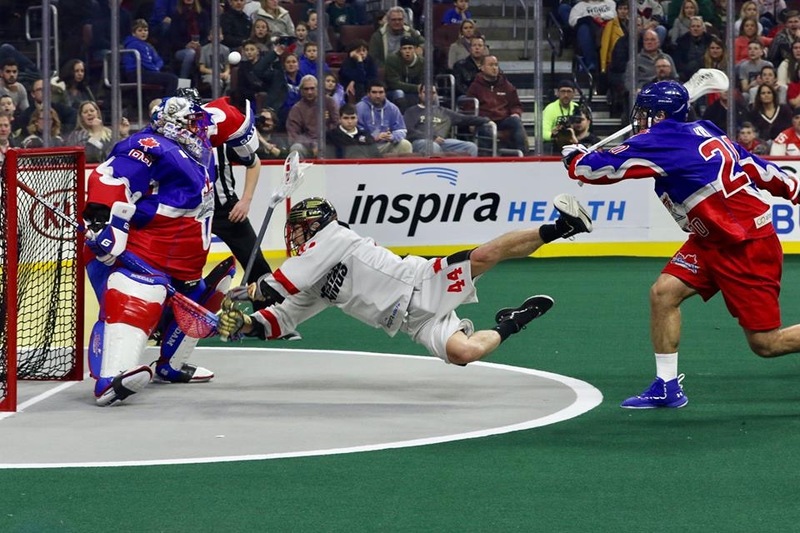 Hellyer scored the backbreaker to give Toronto the victory 13-12. The Rock spoiled the Wings’ “Throwback Night,” in which they wore jerseys from the 1995 championship season. Black (shoulders) and grey (chest/back) trimmed in red with red numerals. Many fans in attendance wore jerseys of the past Wings teams. Throughout the concourse and seats you could see names of John Tucker, Paul & Gary Gait, Dallas Eliuk, Jake Bergey and many others. Bergey was also in attendance greeting fans, taking pictures and signing autographs. Nick Rose, who continues to come up huge for the Rock, outlasted a series of shots as he put the team on his shoulders after a slow start. Hellyer (3G/4A), Jones and Lintner (3G/2A) and Schreiber (2G/4A) led the Rock offense, while Kevin Crowley (4G/6A) and Kiel Matisz (3G/4A) led Philly. Local product Matt Rambo chipped in with two goals. Doug Buchan went the distance in goal for the Wings, making 33 saves. 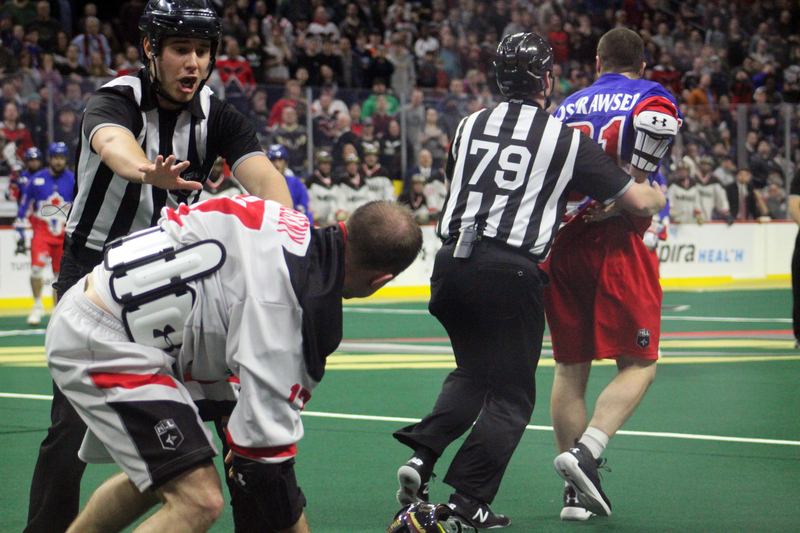 Toronto next returns home to host the defending champion Saskatchewan Rush on Friday. Philadelphia will continue their four game home stand with a rematch with the Rochester Knighthawks.